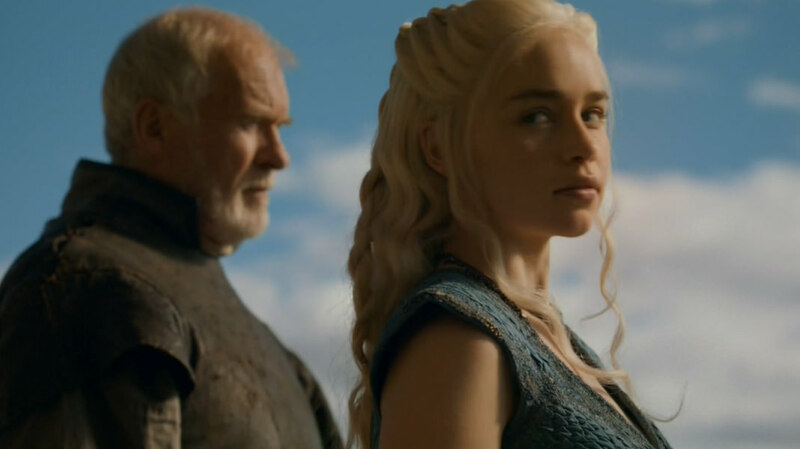 Dany (Emilia Clarke) is badass here! She’s going Old Testament (“an eye for an eye”) by having 163 of the slave masters crucified. In the previous ep, we learned that this number of slaves marked the way to Meereen. I liked the scene between Grey Worm (Jacob Andersen) and Missandei (Nathalie Emmanuel). I hope they’re going to become friends (or maybe more?) in the future. But I still need more Jorah (Iain Glen)! The roguish, yet effective, Bronn (Jerome Flynn) just gets the best lines! 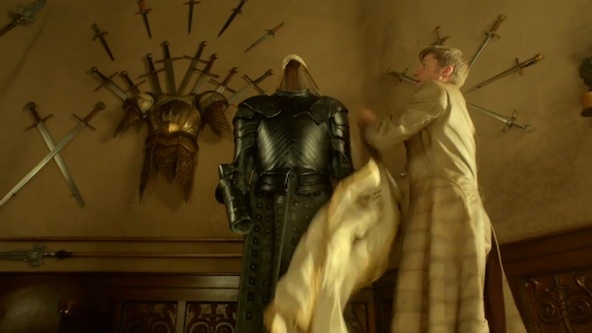 And who didn’t love the (slapstick) scene where he beat Jaime with his own golden hand!? “The Kingslayer brothers” sounds catchy, right? Peter Dinklage shows his leading man chops in this scene (as Roger Ebert said of his performance in The Station Agent). See his eyes? He’s so into the character! 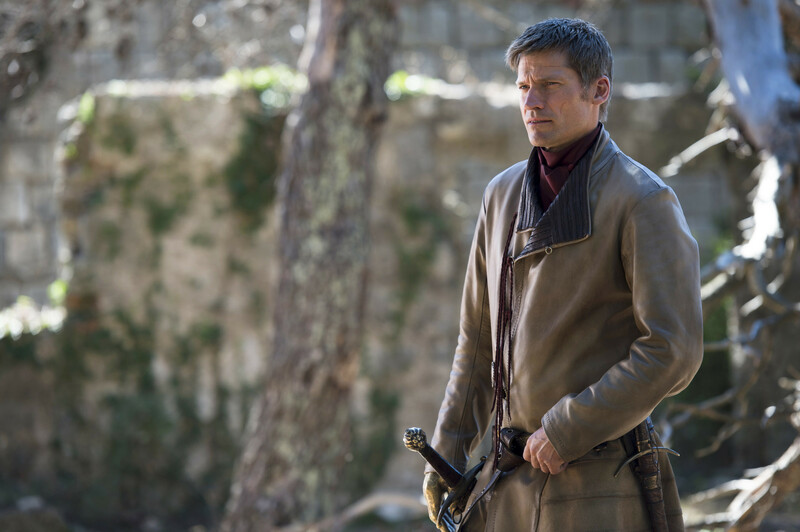 Nikolaj Coster-Waldau continues to show more shades of Jaime. 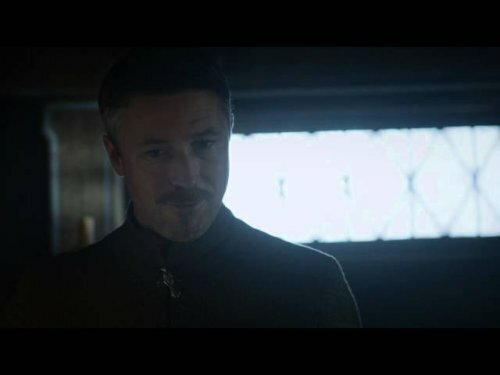 Let’s face it, we missed Littlefinger (Aiden Gillen)! Who knows what he’ll get up to next? And it looks like naïve/young Sansa (Sophie Turner) is finally getting how devious/dangerous he can be! I loved the “Who’d trust you?” line! Awww, Lady Olenna (Diana Rigg) is prepping to leave King’s Landing! But, she still has some words of wisdom for granddaughter, Margaery (Natalie Dormer). What weapons can a mere woman use in Westeros society? Her body, of course! And Margaery’s got wit, charm, and cleverness (thanks in part to Lady Olenna). After that scene in the sept, what can we say re: Jaime and Cersei (Lena Headey)!? It’s a very touchy subject. 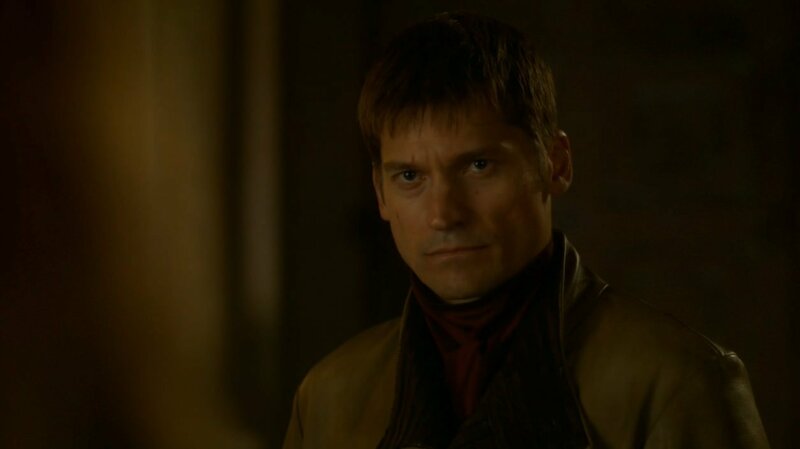 Many viewers were deeply disturbed by how Jaime forced himself on Cersei. George R.R. Martin blogged that “I didn’t write the scene that way.” It was the choice of the showrunners and the director. This show operates in shades of gray, keep in mind! We see Cersei drinking (not a shocker) and generally being bitter and formal with her twin. Jaime is confused and hurt. They are officially broken up now. This scene could’ve been creepy, but Margaery kept it sweet and innocent. And how cute a name is Ser Pounce!? 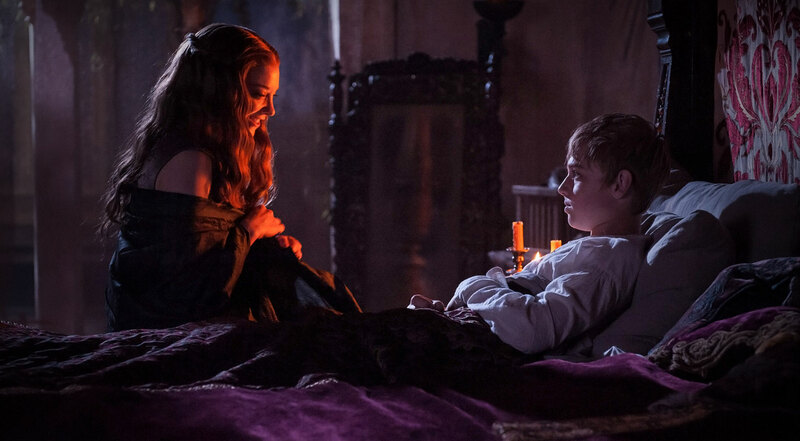 Tommen (Dean-Charles Chapman) seems like a great little guy- so unlike Joffrey (thank the Old Gods and the Seven). 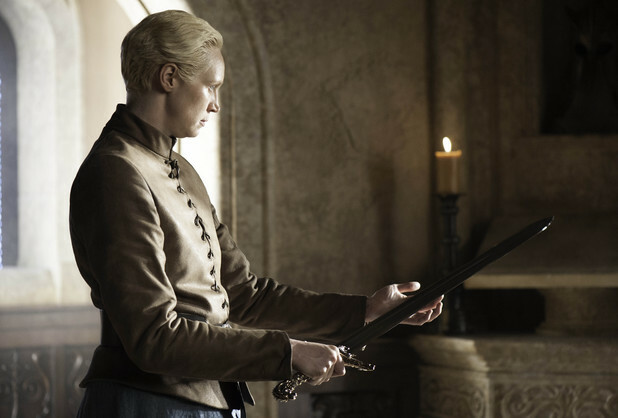 Brienne (Gwendolyn Christie) is very humbled and surprised when Jaime gives her his sword. He explains that it was forged from Ned Stark’s sword, so it’s fitting that she use it to protect Sansa. Maybe Brienne will meet Arya, too? That would be cool! Dressed in her new armor, Brienne looks more formidable than ever, but there is vulnerability in her eyes. She and Jaime exchange some wistful looks before she rides off. Is this romantic love? No, I think it’s something beyond that. They just seem to get each other, though one of them is a tarnished knight, while the other is pure of heart and still honorable. Though she doesn’t use that title, Brienne is the classiest “lady” in the realm! Not sure what’s going to happen with Jon, Sam, the psychotic brothers at Crastor’s Keep, and Bran’s crew. I’m esp. worried re: Meera- being a young woman in that place (shudder)! 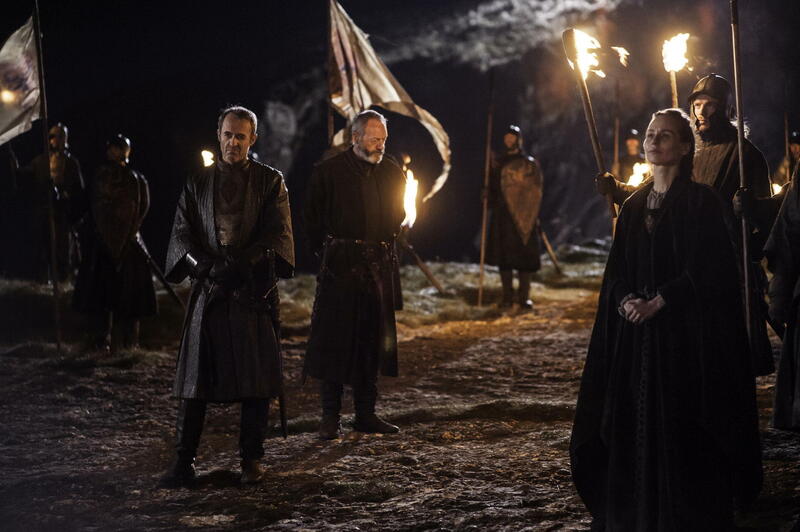 Did you see Locke (Noah Taylor) among the new recruits of the Night’s Watch? He’s one sneaky guy; he gets chummy with Jon right away. SPOILERS: Don’t read this (reblogged) review if you have not yet seen or don’t want to know details from the most recent episode of Game of Thrones (Breaker of Chains). You know how we can be sure that Game of Thrones showrunners David Benioff and D.B. Weiss love us? They open this week’s episode with a lingering shot of Joffrey’s cold, dead face – I may make it my screen saver – as we pick up where the last episode ended: Cersei shrieking, Tyrion being hauled to the dungeon and Sansa and Dontos fleeing the scene. SPOILERS: Don’t read this review if you have not yet seen or don’t want to know details from the most recent episode of Game of Thrones. 10) Tyrion toasts himself and the Lannister siblings:”…the Imp, the cripple, and the mother of madness” at breakfast w/ big brother, Jaime. 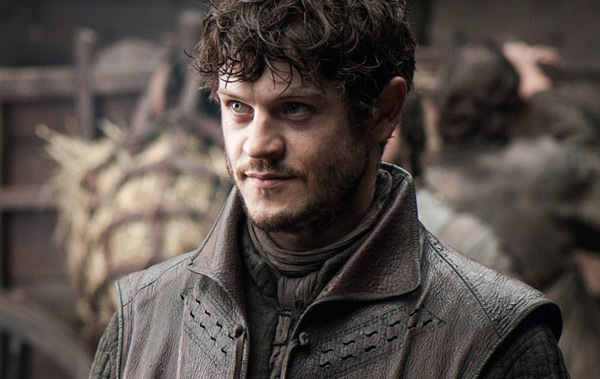 Theon now looks like a completely broken man. He finally learns that Robb (who he thought of as a big brother) was murdered. 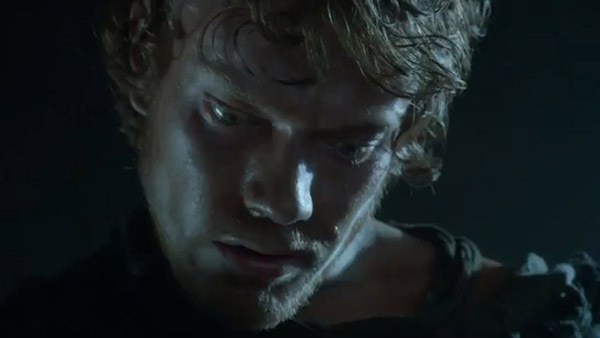 Alfie Allen will have some (more) acting challenges this season, I’m sure! 7) Varys tells Tyrion that Shae has been found out (we know by one of Cersei’s spies), but he can help her escape across The Narrow Sea. 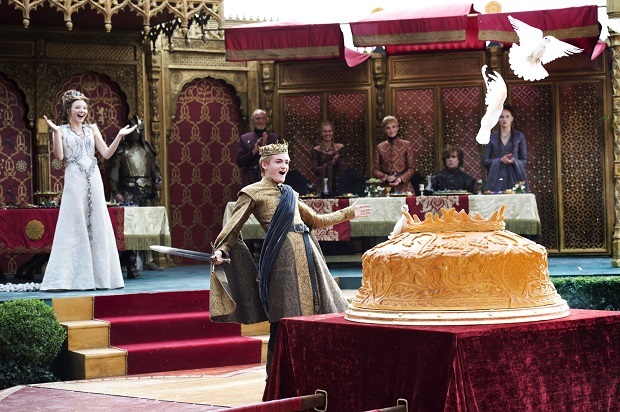 At the wedding breakfast for Joffrey, Cersei points out Shae to Tywin (who warned Tyrion in Season 2 that he’d kill “the next whore I find in your bed.”) Then we have the break-up scene- Tyrion tells Shae that she’ll “have a comfortable life in Pentos,” how he wants to be true to his wife (Sansa), then cuts her down so much that she starts to weep loudly (though she’s a tough gal)! 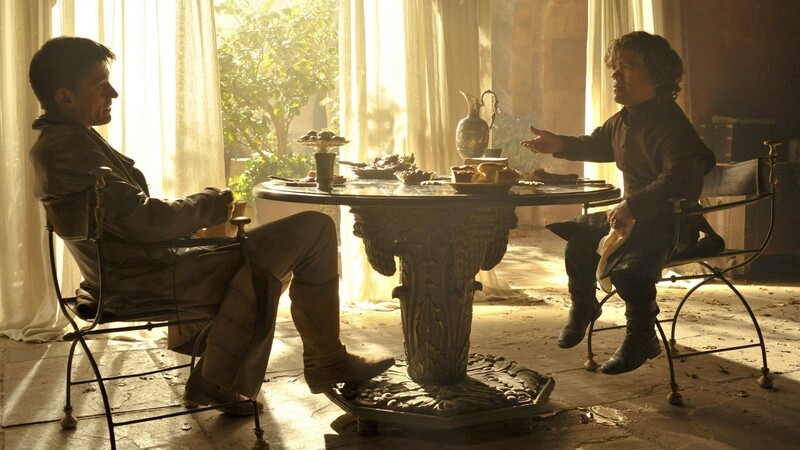 Peter Dinklage surprised me in this scene, since I didn’t think Tyrion could be so harsh with someone he loved. 6) At Dragonstone (Stannis Baratheon’s stronghold), we see few men being burned at the stake for not converting to The Lord of Light; such occurrences were mentioned in Season 2. Melisandre presides over the event. One of these men is the brother of Selyse, but she doesn’t care, being a total fanatic. My favorite character is back! Ser Davos (Liam Cunningham), looks away while they’re burned. He tells Stannis: “He worshipped the gods of his fathers, and his fathers before him. They were the gods of your fathers, too.” Stannis doesn’t like such comments, since he’s also devoted to this new religion. We learn more about Selyse later on in a dinner scene, where she tries to connect w/ her husband over their shared struggles during the war. She misses, of course, as Stannis is a man cut off from his emotions. Selyse calls their daughter, Shireen, “a stubborn little beast.” Stannis commands: “She’s my daughter. You will not strike her.” Hmmm… maybe he’s not all bad? Melisandre wakes up Shireen and tells her more about her religion: “There is only one Hell, Princess, the one we live in now.” Carice Van Houten has such a screen presence! Got ’tween a sleep and wake? Perhaps George R. R. Martin (who wrote this episode) was inspired by Shakespeare there? 4) “And neither will you,” Loras Tyrell one ups Jaime with these words, when Jaime says he’ll never marry Cersei. Good one! 3) “But you love him” Cersei replies to Brienne, who’s surprised by this accusation. Jaime, the topic of this tense conversation, is watching both ladies (but can’t hear them). 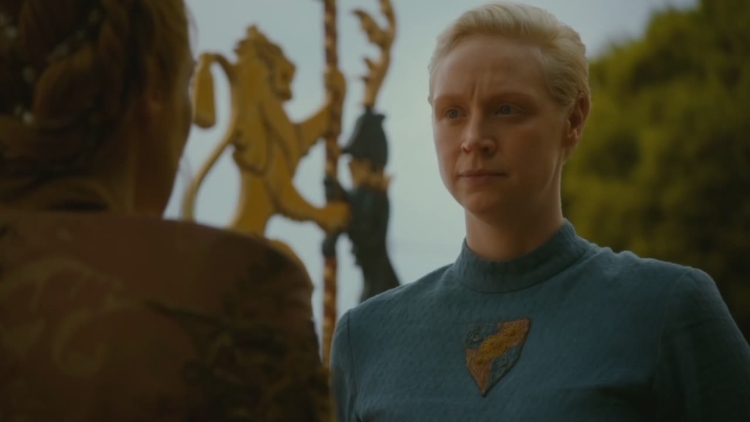 Gwendolyn Christie reveals more of Brienne in this episode with just a few looks: social unease, innocence (of politics), and good manners (even toward King Joffrey, who cuts down her beloved Renly).